We’ve had entire week of warm and dry weather, which is good because we have a million things to do. 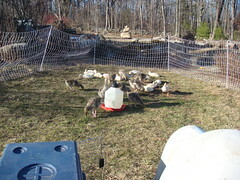 The waterfowl went outside last weekend, in electric poultry netting. 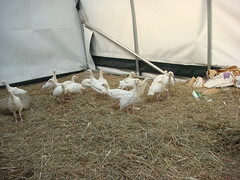 They started with a dogloo for shelter, yesterday we added a dog crate so the ducks and geese each have their own digs. They’re pretty hard on the lawn, but leave behind lots of fertilizer. The turkeys stayed inside for a few more days, until they quit huddling under the heat lamp. They’re out in the now-empty hay house. We need to do something else tomorrow. They started flying over the net in front about 4 pm today. The hay house is empty because we’re now using marshmallow hay. Actually we’re using whatever we can find. Last year was a bad year for hay. This stuff is quite good however. The sheep like it a lot, and it looks and smells very good. Yesterday we reconfigured the pig containment system. Lisa took the rams off to be sheared, and when they returned they went in with the girls. 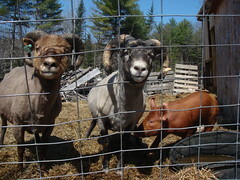 This let us bring Albus forward to start rooting up the rams’ hay pack. (Slow going because there’s still ice there.) We ran electronet behind the pig palace and the remains of the horse house and pulled down the cattle panels along the road. This has been replaced with proper woven wire sheep and goat fence. Lisa planted peas, carrots, parsnips, lettuce and spinach in the new area. The pigs are being encouraged to cultivate the area in front of the horse house so we can plant there soon. By the time they finish that, we hope to have the sheep moved on so the pigs can clean up that hay pack. 1. Starve out plane and simple. Less drawn comb than i thought, less than a tablespoon of honey in the hive. I guess more feeding might have saved this crew. 2. This was the hive that went queenless twice. I was amazed to see them in February. My guess is inadequate cluster size. They were actually making honey from the syrup when they died. There was half a frame of uncapped honey but nothing left from the summer. This was hive that hated plastic frame. They sure did. Fewer than half the twenty frames were even half drawn. 3. I dunno. There was a good bit of honey left, but they died anyway. The honey was all along the top of the hive. It’s possible they couldn’t reach it without breaking cluster, which it was way too cold to do. These gals by contrast with the last crew had drawn all but two or three sides of their plastic frames. They did make it clear that plastic is second best. Some of the honey had black mold on it. I hadn’t seen that previously. 4. Finally, the survivors. A decent number of bees with some honey left. For whatever reason they haven’t been eating syrup either, which has me a little worried. I saw lots of pollen coming in, but no nectar, nor did I expect any. All the action was in the top super. The bottom one was empty except for bees passing through. I only found one frame of brood, and that with a bad pattern. I didn’t see the queen either. 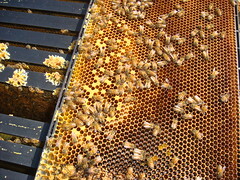 I reversed the hive bodies and will check for brood again as soon as there’s an actual honey flow. The maples should start any day now. We have two nucs coming from Charlie Andros at Linden Apiaries. We’re on the waiting list for two more from Champlain Valley Bees and Queens, but it’s starting to look unlikely that we’ll get any. Finally, the return of the beavers has benefited the local frog population. It’s been several years since we had a spring this loud. I hope they eat the mosquitoes too. This entry was posted in Carrots, Ducks, Frogs, Geese, Honey Bees, Icelandic, Lettuce, Mice, parsnips, Pigs, Rams, Shearing, Sheep, spinach, Turkeys. Bookmark the permalink. Post a comment or leave a trackback: Trackback URL.